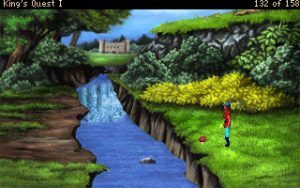 There have been several releases of King’s Quest over the years, starting with the original version in 1983, which was packaged up in the IBM PC Jr series of computers. Fortunately, poor sales of the computer did not result in the termination of the King’s Quest franchise, as it was released in Apple II, PC (boot disk) and Tandy format in 1984 to general fanfare, and around 500,000 copies sold. The game sold well enough that it was re-released in 1987 in the Amiga, Atari ST, Macintosh and MS-DOS formats, which sent it back up the sales charts.